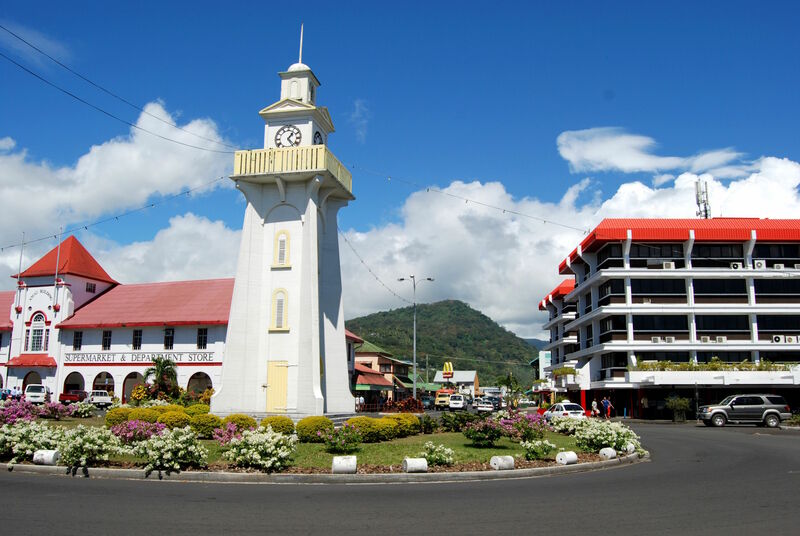 Downtown Apia, the urban capital of the Independent State of Samoa, complete with a McDonald’s. Source: Jason Argo, Flickr. Islanders, including the rising burden of non-communicable diseases (NCDs) and continued prevalence of communicable diseases, remain largely ignored and unaddressed, both within the context of the Pacific and among migrant communities around the world. It is particularly important to understand the health disparities among Pacific Islanders because the issues that exist today are, at least in part, the result of imperialist action by the United States and other Western powers. The Pacific Islands are known and discussed internationally today for two reasons: tourism and military battles and bases. The Pacific is often viewed as open and untouched—a beautiful, natural space for vacation and fantasy. Tourism on islands like Hawai’i began after their seizure and annexation by Western powers like the United States to counter Japanese power in the region at the end of the 19th century.2 The annexation of Hawai’i began with the overthrow of the Hawaiian kingdom by white plantation owners backed by the U.S. military. This was the first in a process of events forcing Native Hawaiians out of their homes and traditional ways of life, replacing staple crops such as taro and sweet potatoes with sugar cane and constructing luxury resorts and military bases over sacred burial grounds.3,4 In other parts of the Pacific, imperial military control has had even more destructive results, as nuclear weapons testing poisoned native peoples and their homes for generations in the Marshall Islands and French Polynesia.5 In spite of and perhaps because of this legacy of Western involvement, Pacific Islanders are largely unknown to much of the world. This obscurity is fueled by the perceived isolation of the islands, which are often excluded from world maps. In addition, the Asian American and Pacific Islander (AAPI) label remains widely used within the U.S., despite having since been replaced on the census with Native Hawaiian and Other Pacific Islander (NHOPI), which further obscures the distinct concerns of Pacific Islanders.6 Without data about these specific concerns and experiences, the health issues Pacific Islanders face cannot be widely understood or represented. Pacific, ischemic heart disease is the leading cause of deaths annually, followed by diabetes and cerebrovascular disease, all of which are NCDs.7 As a result of these conditions, 70-75% of deaths in the Pacific are considered premature, occurring before the age of 60.8 Even these statistics specific to the Pacific, however, obscure disparities and differences between the countries and territories. For example, in the Federated States of Micronesia, NCDs account for 73.9% of DALYs, but NCDs make up only 54.06% of DALYs in Papua New Guinea.7 Similarly, while, in the Northern Mariana Islands, injuries make up 13.75% of DALYs, in Samoa, they account for 9.74%.7 Though each island has its own unique balance of health concerns, the growing burden of NCDs is relevant throughout the Pacific and is often not discussed. One of the foremost health concerns among Pacific Islanders is obesity and the associated NCDs. In American Samoa, 95% of the population is considered overweight or obese.9 Similarly, 57% of people in Tonga are obese, compared to 35.7% of Americans.10,11 The high BMI and dietary risk factors associated with obesity are the top two leading causes of NCD-related death and disability in Oceania.7 Ischemic heart disease and diabetes, for which obesity is a risk factor, are among the top three causes of deaths in the Pacific. In the case of diabetes, prevalence among adults aged 20-79 ranges from 6.33% in Papua New Guinea to 37.06% in the Marshall Islands, compared to 9.3% among Americans.12,13 Because diabetes is a major risk factor for renal failure, chronic kidney disease is the fourth leading cause of death in American Samoa, Micronesia, Fiji, and the Marshall Islands.7 Understanding these serious conditions and their causes is central to providing effective treatment to improve the health of Pacific Islanders. 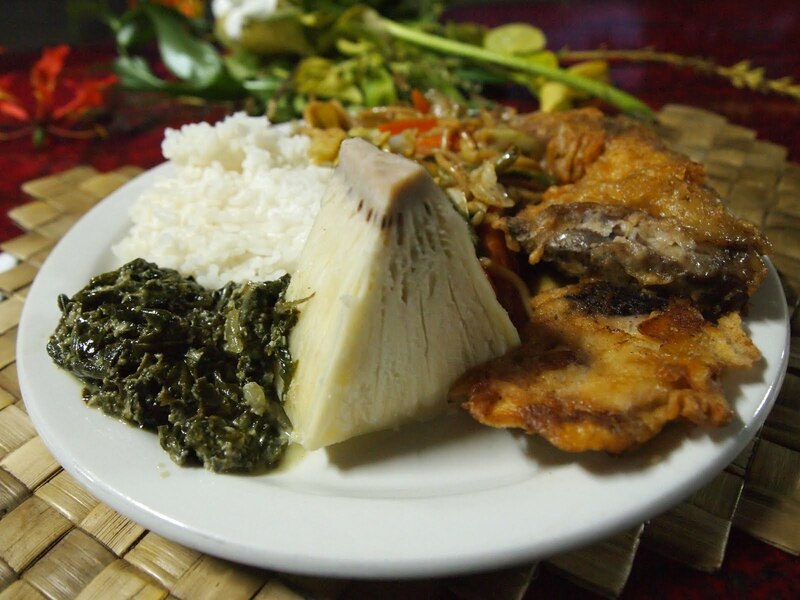 An example of a Samoan diet, including palusami (made with taro leaves and coconut cream), bread fruit, lo mean, and fried meat. Source: Cherrie Mio Rhodes. 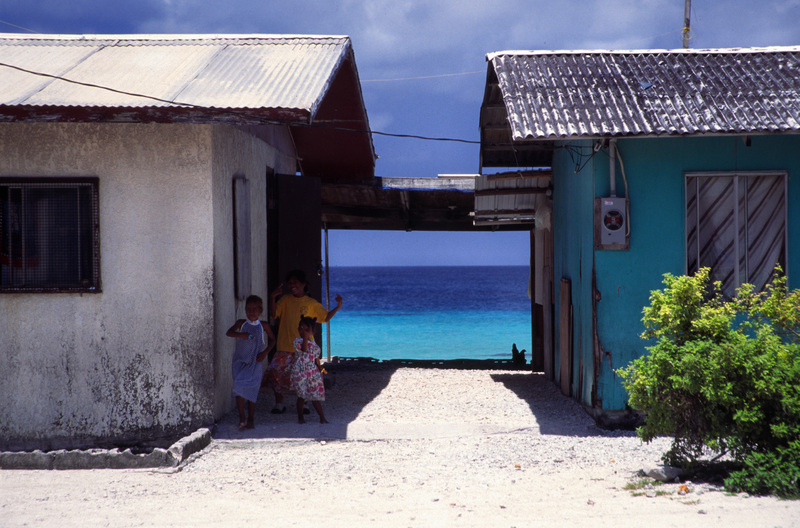 A home in Majuro, an atoll in the Marshall Islands. Source: Stefan Lins. Pacific Islands continue to face this double burden of communicable and non-communicable disease. Despite the need for addressing the rising burden of NCDs, it is also important to recognize that communicable diseases are still a concern and that these issues occur in different combinations in each community throughout the Pacific, and in diaspora. Understanding the health concerns facing Pacific Islanders is crucial to more adequately addressing them both in the Pacific and among immigrant communities. Migration to and from the United States, Australia, New Zealand, and throughout the Pacific is common.21 It is estimated that at least 16,000 Pacific Islanders leave home each year, often young migrants looking for better education or work and sending remittance back to their families.22 As of 2010, 1.2 million people in the United States self-identified as Native Hawaiian and Other Pacific Islander.23 New Zealand has the second-largest population, at nearly 300,000 Pacific Islanders, not including the indigenous Maori population.24 The health issues observed among populations in the Pacific are also found among these immigrant populations in diaspora. 33.13% of NHOPI report having hypertension, compared to 25.05% of white Americans, and 36.44% of NHOPI are obese, compared to 27.2% of white Americans.10 Similarly in New Zealand, 67% of adults and 30% of children who identify as Pacific Islanders are obese, compared to 32% of adults and 11% of children in the broader New Zealand population.25,26 These statistics demonstrate the importance of understanding and addressing the health issues specific to Pacific Islander cultures and contexts, even outside the Islands themselves. Although there are millions of Pacific Islanders living within and outside of Oceania, their health concerns are largely unknown and under-studied. Similar to the obscuring effect that the “AAPI” label has had in inappropriately grouping Pacific Islanders with dissimilar groups, the use of Native Hawaiians and Polynesians to represent the entire Pacific obscures the interests of people from Melanesia and Micronesia. While Pacific Islanders have many common interests and shared health concerns, they remain an amalgamation of thousands of unique peoples. To appropriately understand and address their unique concerns, increased awareness and study of the region is crucial. More data needs to be collected about the burden and causes of disease and disability within individual regions of the Pacific, instead of using only a few cultures, usually those of Polynesia, to represent the interests of all Pacific Islanders. Finally, it is crucial that these efforts involve Pacific Islanders in studying their own health issues, because they are best prepared to understand how best to intervene to the benefit of their own people. Erica Kocher is a junior in Silliman College majoring in Sociology. Contact her at erica.kocher@yale.edu. The World Bank. (2016). Pacific Islands Overview. Retrieved from http://www.worldbank.org/en/country/pacificislands/overview. Goodyear-Ka’opua, N., Hussey, I. & Kahunawaika’ala Wright, E. (2014). A Nation Rising: Hawaiian Movements for Life, Land, and Sovereignty. Durham NC: Duke University Press. Trask, H.-K. (1999). Lovely Hula Hands From a Native Daughter: Colonialism and Sovereignty in Hawai’i. Honolulu: University of Hawai’i Press. Beechert, E. (1985). Working in Hawaii: A Labor History. Honolulu: University of Hawaii Press. Teaiwa, T. K. (1994). bikinis and other s/pacific n/oceans. The Contemporary Pacific, 6(1), 87- 109. Hall, L. K. (2015). Which of These Things Is Not Like the Other: Hawaiians and Other Pacific Islanders Are Not Asian Americans, and All Pacific Islanders Are Not Hawaiian. American Quarterly, 67(3), 727-747. Global Burden of Disease (GBD) Compare. (2016). Retrieved from https://vizhub.healthdata.org/gbd-compare/. The World Bank. (2014). Pacific Islands: Non-Communicable Disease Roadmap. Retrieved from http://www.worldbank.org/en/news/feature/2014/07/11/pacific-islands-non-communicable-disease-roadmap. Keighley, E. D., McGarvey, S. T., Quested, C., McCuddin, C., Viali, S., & Maga, U. O. A. (2007). Nutrition and health in modernizing Samoans: temporal trends and adaptive perspectives. In R. Ohtsuka & S. J. Ulijaszek (Eds. ), Health Change in the Asia-Pacific Region: Biocultural and Epidemiological Approaches. Cambridge: Cambridge University Press. Centers for Disease Control and Prevention. Summary Health Statistics for U.S. Adults: National Health Interview Survey, 2012. (2014) Vital and Health Statistics, 10(260) Hyattsville MD: National Center for Health Statistics. World Health Organization. (2017). Countries and areas. Retrieved from http://www.wpro.who.int/countries/en/. Knoema. World Development Indicators (WDI), September 2015. (2015). Retrieved from https://knoema.com/WBWDIGDF2015Aug/world-development-indicators-wdi-september-2015. Minster, R. L., Hawley, N. L., Su, C.-T., Sun, G., Kershaw, E. E., Cheng, H., Buhule O. D., Lin J., Reupena M. S., Viali S., Tuitele J., Naseri T., Urban Z., Deka R., Weeks D. E., McGarvey, S.T. (2016). A thrifty variant in CREBRF strongly influences body mass index in Samoans. Nature Genetics, 48, 1049-1054. Popkin, B., & Gordon-Larsen, P. (2004). The nutrition transition: worldwide obesity dynamics and their determinants. International Journal of Obesity, 28, S2-S9. Snowdon, W., Raj, A., Reeve, E., Guerrero, R. L., Fesaitu, J., Cateine, K., & Guignet, C. (2013). Processed foods available in the Pacific Islands. Globalization and Health, 9(53). Singer, M. (2014). Following the turkey tails: neoliberal globalization and the political ecology of health. Journal of Political Ecology, 21, 437-451. Whitehouse, P. Z. a. S. (1981). Pacific islands of Nauru Tuvalu and Western Samoa. In H. C. Trowell (Ed. ), Western Diseases, Their Emergence and Prevention: Hodder & Stoughton Ltd.
Takahashi, T., Schoemaker, M. J., Trott, K. R., Simon, S. L., Fujimori, K., Nakashima, N., Fukao, A., Saito, H. (2003). The Relationship of Thyroid Cancer with Radiation Exposure from Nuclear Weapon Testing in the Marshall Islands. Journal of Epidemiology, 13(2). Danielsson, B. (1990). Poisoned Pacific: The Legacy of French Nuclear Testing. Bulletin of the Atomic Scientists. Ka’ili, T. (2005). Tauhi va: Nurturing Tongan Sociospatial Ties in Maui and Beyond. The Contemporary Pacific, 17(1), 83-114. United Nations Poulation Fund. Population and Development Profiles: Pacific Island Countries. (2014). Fiji: United Nations Population Fund. Hixson, L., Hepler, B. B., & Kim, M. O. (2012). The Native Hawaiian and Other Pacific Islander Population: 2010. 2010 Census Briefs. Washington DC: US Census Bureau. NZ Ministry of Health. Tagata Pasifika in New Zealand. (2014). Retrieved from http://www.health.govt.nz/our-work/populations/pacific-health/tagata-pasifika-new-zealand. NZ Ministry of Health. Annual Update of Key Results 2014/15: New Zealand Health Survey. (2015). Wellington NZ: Ministry of Health. NZ Ministry of Health. Annual Update of Key Results 2015/16: New Zealand Health Survey. (2016). Wellington NZ: Ministry of Health.